This morning in Huntington at 7:00AM it’s currently 59 degrees under partly cloudy skies. Winds are calm. Relative humidity is 99%, dewpoint 59, barometric pressure 29.74”. We picked up 0.20” or rain in the past 24hrs. Yesterday’s high was 81, and the overnight low was 58. Quiet weather is expected today before a series of disturbances in the flow aloft bring scattered showers and isolated thunderstorms to the region tonight through Saturday. We’ll see partly sunny skies today with highs in the upper 70s and west winds around 10 mph. Tonight should be partly cloudy with isolated showers after midnight. Lows will be around 60 with southwest winds around 10 mph. Chance of rain is 20%. Saturday should be partly sunny with isolated showers in the morning, then scattered showers with isolated thunderstorms in the afternoon. Highs will be in the upper 70s with southwest winds around 10 mph. Chance of rain is 50%. Saturday night should be partly cloudy with scattered showers. Lows will be in the upper 50s with southwest winds around 10 mph. Chance of rain is 40%. Sunday’s looking partly sunny with highs in the upper 70s and southwest winds around 10 mph. Sunday night should be partly cloudy with a 40% chance of showers. Lows will be in the lower 60s. Last year on this date we had a high of 73 and a low of 53. 15d 9h old with 100% illumination. Other names for this full moon include: “Summer” (Colonial American), “Hay” (English), “Claiming” (Celtic), “Mead” (Medieval Wiccan), and “Rose” (Neo-Pagan Wiccan). Today’s full moon is also a somewhat rare “Blue Moon”. No, it has nothing to do with the color of the moon, but rather the fact that we’re getting two full moons in one month (the other was on July 1st.) During most years, the Earth experiences 12 full moons, one in each month. But some years, such as 2015, have 13 full moons, and one of those “extra” lunar displays gets the label of Blue Moon. You can read more about it here. Small things regarded closely yield new worlds. This morning in Huntington at 6:50AM it’s currently 64 degrees under clear skies. Winds are calm. Relative humidity is 99%, dewpoint 64, barometric pressure 29.79” and falling. We picked up 0.07” of rain yesterday afternoon. Yesterday’s high was 90, and the overnight low was 61. A cold front, its leading edge currently along the western edge of Lake Erie, will move eastward today bringing widespread showers and thunderstorms to our region later today. We’ll see mostly sunny skies this morning, then showers and thunderstorms this afternoon as the front moves through sometime between 5:00 & 7:00PM. Some thunderstorms may produce gusty winds and heavy rainfall this afternoon. Highs will be in the mid 80s with south winds 10 to 15 mph. Chance of rain is near 100%. Tonight should be mostly clear with lows in the lower 60s and southwest winds around 10 mph. Friday should be mostly sunny with a 20% slight chance of showers in the afternoon. It will be noticeably cooler with highs in the upper 70s and west winds around 10 mph. Friday night should be partly cloudy with a 30% chance of showers. Lows will be in the upper 50s with southwest winds around 10 mph. Saturday’s looking partly sunny with a 50% chance of showers. Highs will be around 80 with southwest winds around 10 mph. Saturday night should be partly cloudy with a 50% chance of showers. Lows will be in the upper 50s. Last year on this date we had a high of 75 and a low of 46. The record low was 45°F in 1968. The Moon is a waxing crescent, 14d 9h old with 99% illumination. 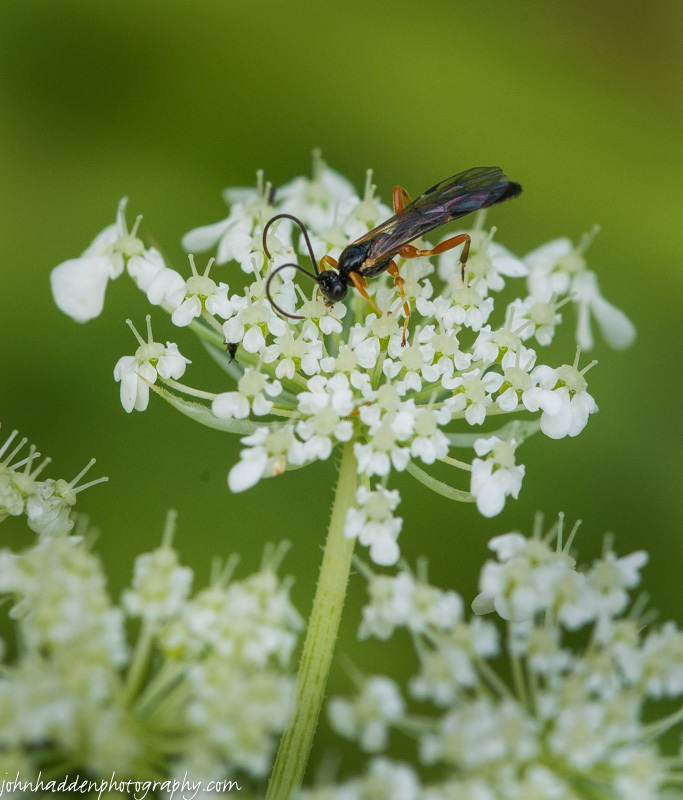 This tiny wasp was only a few millimeters long. It was busy working a small patch of a larger Queen Anne’s lace bloom in our front field. Nikon D600, Sigma 105mm macro, ISO 800, f/13, 1/500″ exposure. This morning in Huntington at 7:05AM it’s currently 64 degrees under mostly clear skies. Winds are calm. Relative humidity is 99%, dewpoint 64, barometric pressure 29.95”. Yesterday’s high was 87, and the overnight low was 61. We’ve got a dog day on tap today with warm, muggy air in place. We’ll see mostly sunny skies with patchy fog this morning, then a slight (20%) chance of diurnal heating showers and thunderstorms over the mountains this afternoon. Highs will be in the upper 80s to low 90s with light and variable winds. Tonight should be clear and muggy with lows around 70 and light and variable winds. Thursday should start out mostly sunny in the morning, then become mostly cloudy with a 50% chance of showers and thunderstorms in the afternoon as a cold front moves through from the west. Some thunderstorms may approach severe levels with gusty winds, small hail and heavy rainfall in the afternoon. Despite the clouds, it’ll be warm and humid with highs in the mid 80s and south winds around 10 mph. Thursday night should be mostly clear with lows in the lower 60s and southwest winds around 10 mph. Cooler, more seasonable conditions are on tap for Friday with mostly sunny skies and highs around 80 with west winds around 10 mph. Friday night should be mostly clear with lows around 60. Last year on this date we had a high of 70 and a low of 43. We picked up 1.36″ or rain. Tomorrow will be 2m15s shorter. The Moon is waxing gibbous, 13d 9h old with 95% illumination. As I was out bug hunting the other day, I caught this pair of competing critters. 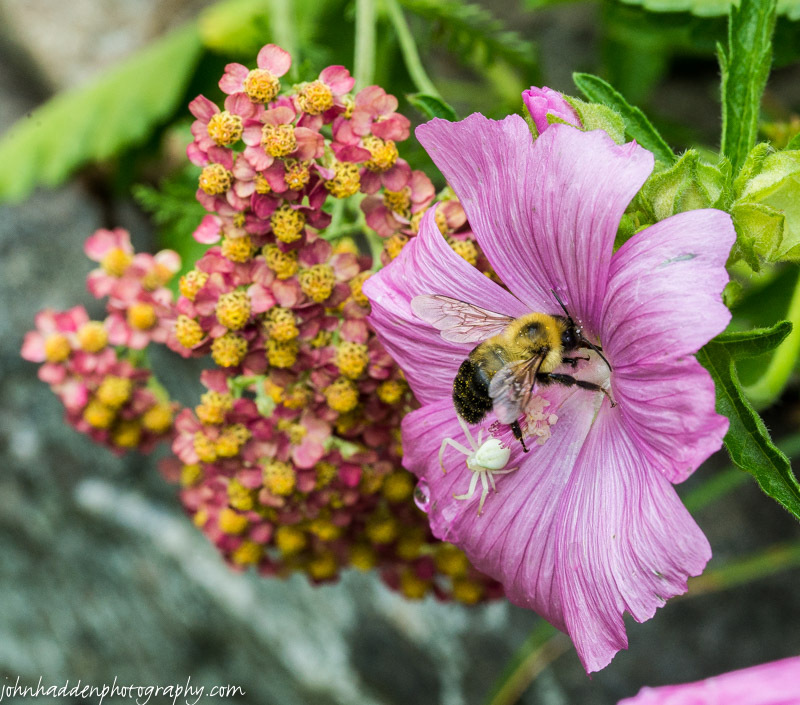 The crab spider was waiting in the mallow blossom for breakfast to arrive when the bumble bee just, well, bumbled into the scene. The spider politely stepped aside, but I did recently see a photo (by Jim W.) of a crab spider eating a bumble bee, so I suppose this one got off lightly! Nikon D600, Sigma 105mm macro, ISO 800, f/14, 1/200″ exposure. This morning in Huntington at 6:55AM it’s currently 61 degrees under clear skies. Winds are calm. Relative humidity is 99%, dewpoint 61, barometric pressure 29.97” and rising slowly. We picked up 0.35” of rain overnight in some pretty good boomers that rolled through at about 2:30AM. Yesterday’s high was 85, and the overnight low was 60. High pressure sitting over the region and a southerly airflow will combine to ratchet up the temperature and humidity today through Thursday, and diurnal heating will continue the threat of afternoon showers. We’ll see mostly sunny skies today with a 20% slight chance of mountain showers and thunderstorms this afternoon. Some thunderstorms may produce gusty winds, small hail and heavy rainfall this afternoon. Highs will be in the upper 80s with light and variable winds. Tonight should be partly cloudy with a 20% chance of showers and thunderstorms until midnight. Lows will be in the mid 60s with light and variable winds. Wednesday should be mostly sunny with highs in the upper 80s to 90 and light and variable winds. Wednesday night should be mostly clear and humid with lows in the upper 60s and light and variable winds. A sharp cold front will move through Thursday afternoon bringing showers and thunderstorms. Some might approach severe levels. It’ll be humid with highs in the mid 80s to near 90 again with south winds around 10 mph. Chance of rain is 70%. Thursday night should be partly cloudy with lows in the lower 60s. Last year on this date we had a high of 68 and a low of 57. We picked up 0.59″ or rain. Tomorrow will be 2m12s shorter. The Moon is waxing gibbous, 12d 9h old with 89% illumination. We have several patches of wild raspberries around the place. 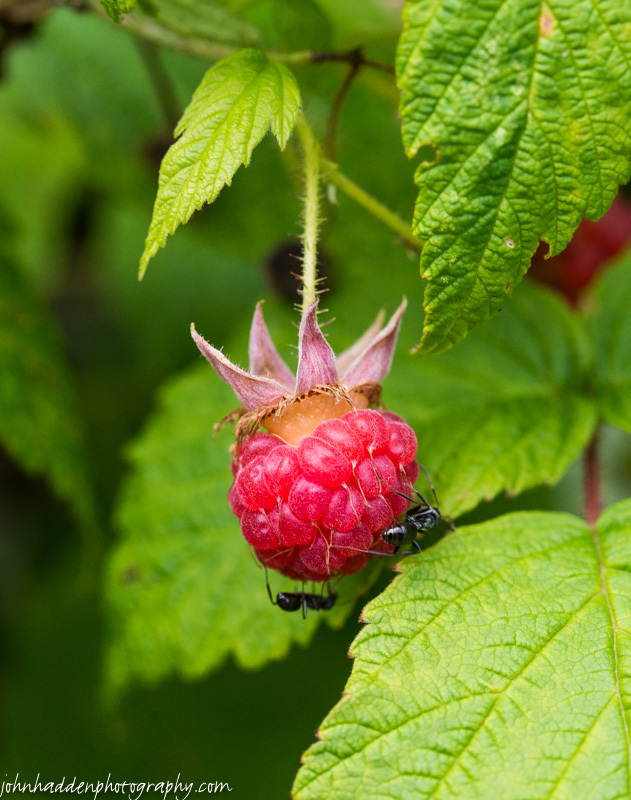 I noticed a pair of black ants investigating a plump berry by the pond. Nikon D600, Sigma 105mm macro, ISO 800, f/10, 1/250″ exposure. This morning in Huntington at 7:35AM it’s currently 64 degrees under partly cloudy skies. Winds are calm. Relative humidity is 99%, dewpoint 64, barometric pressure 29.98” and rising slowly. Yesterday’s high was 83, and the overnight low was 59. We’ve got some classic summer weather ahead of us for the first half of this week with warm, muggy conditions and occasional convection-based shower popping up. We’ll see partly sunny skies today with a 30% chance of showers and thunderstorms this afternoon. Highs will be in the mid 80s with light and variable winds. Tonight should be partly cloudy with a 20% slight chance of showers and thunderstorms. Lows will be in the lower 60s with light and variable winds. Tuesday should be partly sunny with a 30% chance of showers and thunderstorms, mainly in the afternoon. Some thunderstorms may produce gusty winds and small hail in the afternoon. Highs will be in the upper 80s with light and variable winds. Tuesday night should be partly cloudy with lows in the mid 60s and southwest winds around 10 mph. Wednesday’s looking partly sunny with highs in the upper 80s and west winds around 10 mph. Wednesday night should be partly cloudy with lows in the upper 60s. At this point, it’s looking like a more potent cold front will move through on Thursday bringing rain and cooler temperatures. Stay tuned! Last year on this date we had a high of 80 and a low o 56. We picked up 0.08″ of rain. Tomorrow will be 2m10s shorter. The Moon is waxing gibbous, 11d 10h old with 81% illumination. 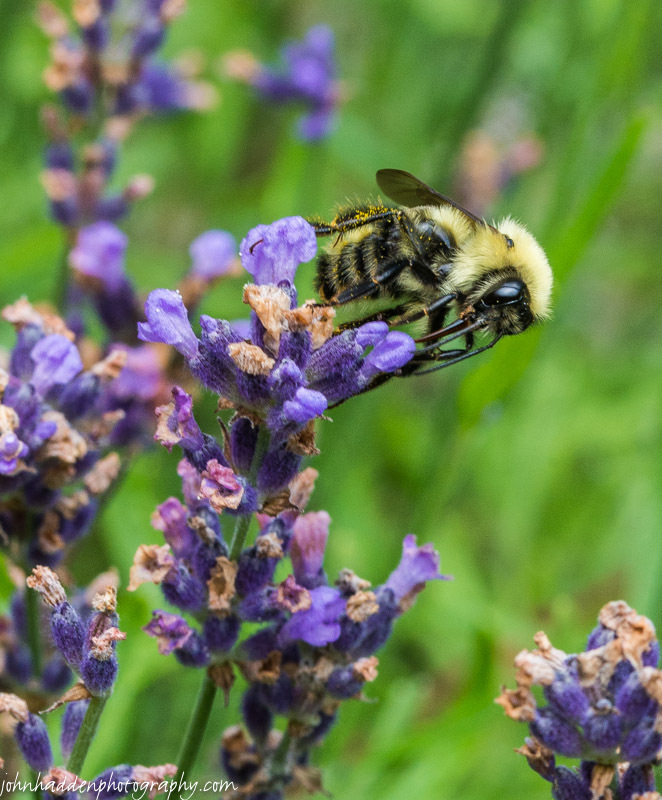 The long tongue of the bumble bee reaches far down into the depths of the lavender blossom by our back patio. Busy time of year in the bee world! Nikon D600, Sigma 105mm macro, ISO 800, f/14, 1/160″ exposure. This morning in Huntington at 9:00AM it’s currently 66 degrees under overcast skies. Winds are calm. Relative humidity is 93%, dewpoint 64, barometric pressure 29.92” and rising slowly. We picked up 0.05” of rain overnight. Yesterday’s high was 81, and the overnight low was 63. Showers will continue across the region this morning as a mid-level trough progresses eastward. With a persistent northwest flow aloft, there will be a chance for afternoon showers and thunderstorms today and again on Monday. We’ll see mostly cloudy skies with showers likely this morning, then partly sunny skies with a chance of showers and thunderstorms this afternoon. Highs will be in the upper 70s with south winds around 10 mph this morning, becoming light and variable. Chance of rain is 60%. Tonight should be partly cloudy with a slight chance of showers and thunderstorms until midnight. Lows will be in the lower 60s with light and variable winds. Chance of rain is 20%. Monday should be partly sunny with a slight chance of showers in the morning, then a chance of showers with a slight chance of thunderstorms in the afternoon. Highs will be in the lower 80s with light and variable winds. Chance of rain is 40%. Monday night should be partly cloudy with a 30% chance of showers. Lows will be in the lower 60s with southwest winds around 10 mph. Tuesday’s looking partly sunny and warm with highs in the mid 80s and west winds around 10 mph. Tuesday night should be partly cloudy with lows in the mid 60s. Last year on this date we had a high of 77 and a low of 52. Tomorrow will be 2m8s shorter. The Moon is waxing gibbous, 10d 11h old with 73% illumination. 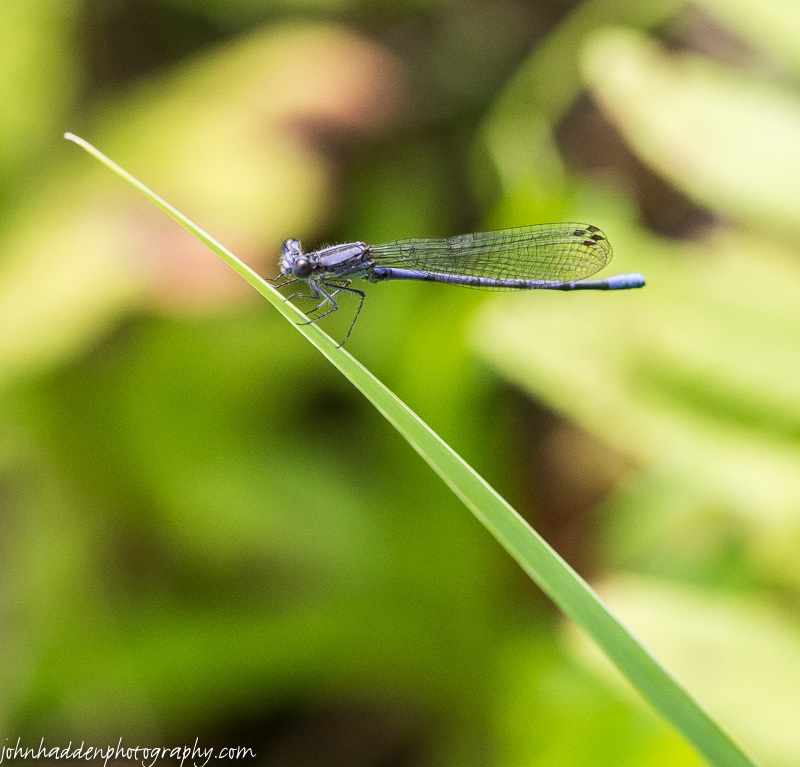 The damselflies and other dragons are active around the pond these days. I stalked this little one for some time before getting a good shot. Nikon D600, Sigma 105mm macro, ISO 800, f/7.1, 1/1000″ exposure. This morning in Huntington at 7:00AM it’s currently 52 degrees under clear skies. Winds are calm. Relative humidity is 99%, dewpoint 52, barometric pressure 30.00” and rising. We picked up 0.05” of rain in the past 24hrs. Yesterday’s high was 72, and the overnight low was 50. This morning’s clear skies and dry conditions will give way to a weak mid-level shortwave trough this afternoon that may kick off some convection showers this afternoon. We’ll see partly sunny skies with a 40% chance of showers and thunderstorms this afternoon. Highs will be in the upper 70s with light and variable winds. A more significant trough will move in from the west tonight bringing cloudy skies with a chance of showers and thunderstorms until midnight, then showers likely with a chance of thunderstorms after midnight. Lows will be in the lower 60s with south winds around 10 mph. Chance of rain is 70%. Sunday should start out mostly cloudy in the morning, then become partly sunny with a 50% chance of convective showers and thunderstorms. Highs will be in the upper 70s with south winds around 10 mph in the morning, becoming light and variable. Sunday night should be partly cloudy with a 30% chance of showers and thunderstorms. Lows will be in the lower 60s with light and variable winds. Warmer, more humid weather will begin to arrive Monday with partly sunny skies and highs in the lower 80s with southwest winds around 10 mph. Monday night should be partly cloudy with lows in the lower 60s. The Moon is waxing gibbous, 9d 9h old with 63% illumination. Tachina flies are common insects in our region—beneficial too as they lay eggs on common pests. 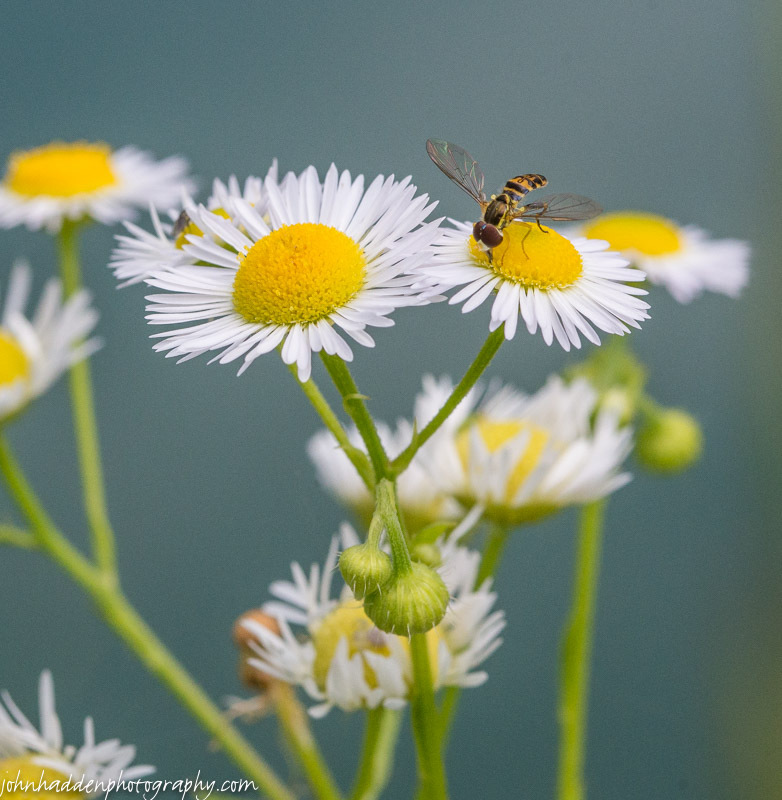 This little feller was busy working some daisy fleabane blossoms by the pond. 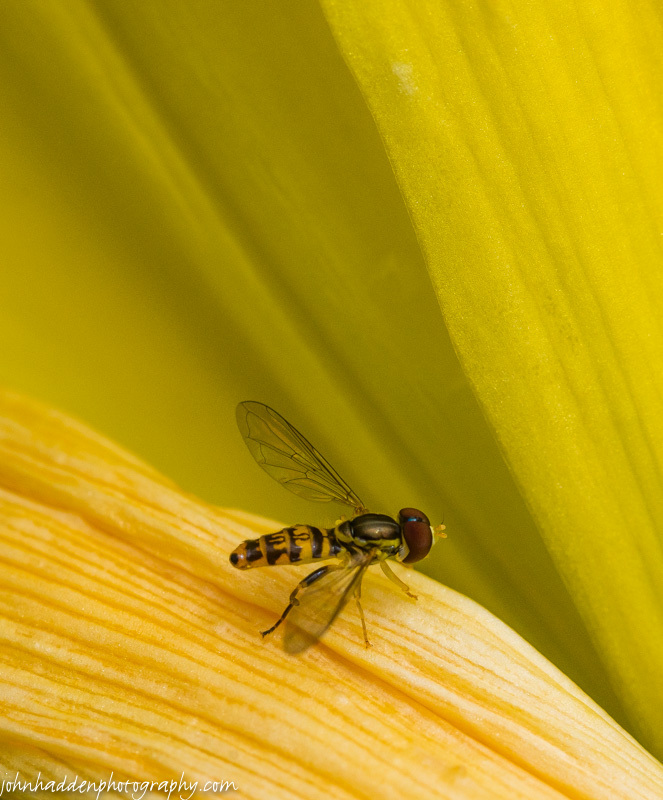 Nikon D600, Sigma 105mm macro, ISO 800, f/13, 1/1000″ exposure.